When I initially walked into Bonhams, I really did not know what to expect. Growing up in Scottsdale, Arizona, I had heard rumors of other auctions during Barrett-Jackson week, but didn’t know who was staging them or where to find them. But since joining the staff of ClassicCars.com, I got the inside scoop and on Tuesday was able to attend the preview at Bonhams. In girl terms, I’d like to think of Barrett-Jackson as something similar to Coach or Michael Kors. It’s a high end brand, but not ridiculously overpriced. Some particular handbags might be, but for the most part what is being sold is attainable. But Bonhams would be the Louis Vuitton or Chanel, primarily reserved for the elite who have no problems dropping a couple thousand dollars on a purse. 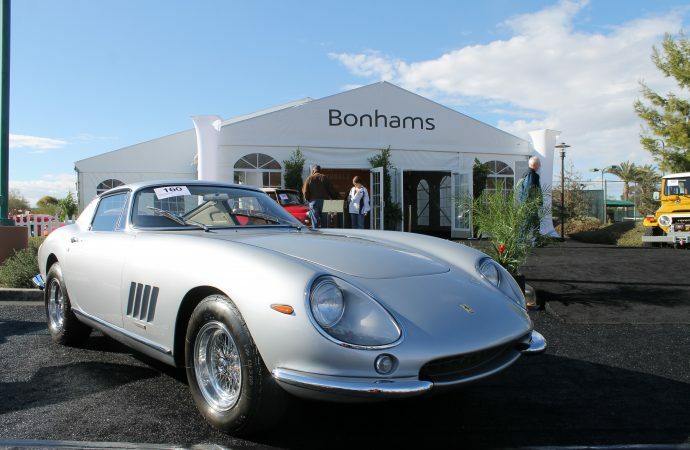 To buy at Bonhams, you better be prepared to drop a couple hundred thousand dollars to a few million on a car. While everything at Bonhams was way out of my even imaginary budget, I found myself wanting to take home nearly every car on site. What can I say, I have expensive tastes. It was love at first site. From the moment I stepped inside the venue I could not keep myself away from this car for long periods of time. What do I like about it? I could probably gush for hours but will contain my affection and keep it simple: it’s a Ferrari, it’s a 1966 Ferrari, its red, and it’s a race car. This car raced at Le Mans. It is estimated to sell for $10-million. I have really grown affectionate toward Mercedes-Benz, particularity the older models. There is just something so glamorous about the silver paint, the seductive body lines, and that shiny grill. I’m not typically a fan of convertibles, but this car does everything right. Estimated to sell for $1.2 million to $1.4 million, the new owner will get all matching numbers, low milage, and a highly original classy car to call their own. Of course another Ferrari would make my list. While this one is the same model, it is not a racecar. However, it still has those beautiful vintage Ferrari lines and is an exceptionally well-restored example of the car. This one has matching numbers and is Ferrari Classiche Certified. How much will this non race car version set you back? A cool $3.3 million to $3.6 million. In case you didn’t notice, I have a thing for Italian sports cars. This one has pearlescent light blue paint to die for and a subtle yet stylish and aggressive hood scope. The front grille features a very prominent Maserati trident with red accents making it pop against the blue paint. For this car you can expect to spend anywhere from $275,000 to $350,000. Hollywood made the most recent Batmobile based off the Lamborghini and a tank. I’d say they got it wrong after seeing this car. This is the car for Bruce Wayne to go speeding around Gotham in this black beauty. To be honest, I have never particularly been a fan of Bugatti, especially the newer stuff, but that soft sport in my heart for classics was taken over by this model. It has everything you need in a classy classic: Big rolling fenders, spoke wheels, headlights practically the size of your head, a long nose, and that classic Bugatti front grill.